This title was first published in 2003. This book assumes a viewpoint practically absent from contemporary economics, and readdresses the first fundamental question of economics: how should we decide how scarce resources should be allocated among competing uses? By focusing on this question the book necessarily reconstitutes the link between ethics and economics. Thus the book deals with a crucial topic: the moral assessment of the market mechanism as a tool for allocating scarce resources. The key tenet of the book is that the market achieves ends that transcends itself - ends that must remain the prerogative of civil society. Questions of the foundations of moral philosophy are considered - allocating scarce resources is shown to be an exclusively human capacity which means that the market is unable to determine such issues endogenously. An intuitionist approach to moral philosophy is developed and this is placed in the context of the history of western moral philosophy. The argument encompasses mathematical logic, philosophy of mind, moral philosophy and economics. This key book will appeal to anyone interested in Economics and Ethics and the role of the state. Contents: Introduction. Moral Knowledge: The necessity and impossibility of a moral criterion; Two types of knowledge; The problem of social choice under a moral relativist framework; Knowledge and its limits; Appendix to chapter 4: GÃ¶del's impossibility theorem; Morality: a history that writes itself; The development of moral knowledge: feelings, reason and free-will; Concluding remarks of part I. Moral Philosophy: Knowledge About Moral Knowledge: Introduction to part II; Ancient philosophy: outlining the groundwork; From the moral implications of 'the Other' to Kantian moral philosophy; Prudence, morality and feelings; Utilitarianism, consequentialism and pragmatism; Concluding remarks of part II. 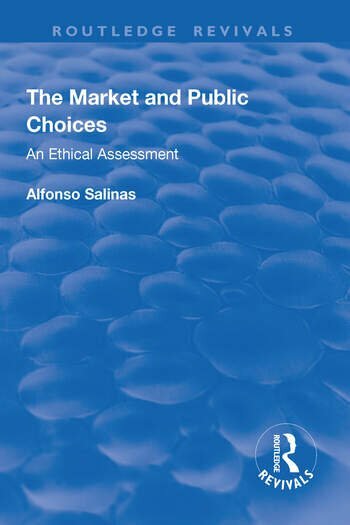 The Market, Moral Knowledge and the Allocation of Resources: Introduction to part III; The market and economic theories: from wealth to ophelimity; Efficiency; The insufficiency of efficiency; Using moral knowledge to assess the market's operation; Externalities; Concluding commentaries; Bibliography; Index of authors. Dr Alfonso Salinas is a Lecturer at the Universidad Jesuita Alberto Hurtado in Chile.